Fireplace weighs approximately 180 lbs. * Please Note: This model is a direct replacement to the previously available FMI Bungalow B42L. For the homeowner looking for an attractive, yet inexpensive way to heat their home, the Superior Wood Burning Fireplace is a great item. This fireplace has a powder coat finish to ensure durability and a "Big Box" look with an oversized brick to brick opening. For anyone who wants a fireplace but doesn't have the large amount of time and money that a traditional one costs, the Superior Wood Burning Fireplace is perfect for you. 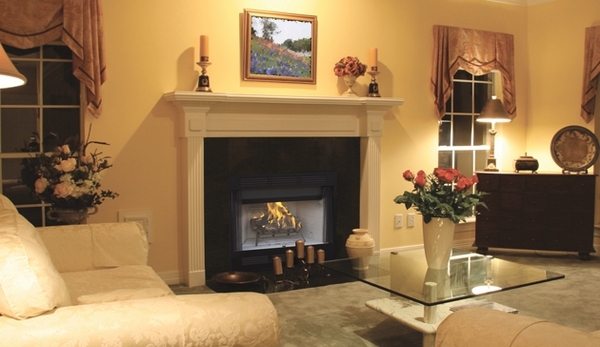 Heat your home with an appealing touch with the Superior Wood Burning Fireplace. Can I add a blower to this unit? Also, can I add a propane line to add gas lighter/starter to this unit? You can indeed use a blower and a propane log starter with this unit. I am looking at WCT2042WS. 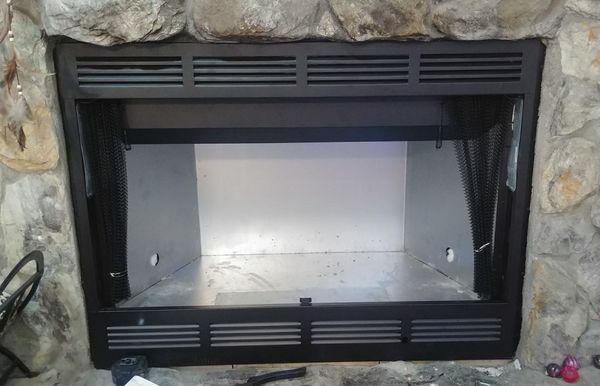 What is the BTU rating of a log lighter that fits in this fireplace? You're going to want to use around a 25,000 BTU log lighter with this fireplace. Can I bring the air vent up the chase to the open attic and out the side of the house, approximately 7 feet up and 7 feet to exit the exterior wall? With this unit's outside air kit, you won't really be able to draw combustion air with a run longer than 4 feet, so I would not recommend running the kit up the chase. The fan is not included with this fireplace. After several fires using hardwoods - I have noticed hairline cracks in the back wall. What is the most common practice to repair the cracks? Hairline cracks in new refractory panels are most often caused by failure to properly cure the panels with smaller fires before burning hot full-sized fires. Hairline cracks can be repaired using refractory cement if they are narrower than the thickness of a dime. Can this unit be fitted with a blower? Yes, you may install an optional blower in the fireplace. What is the average burn time overnight with the doors closed? 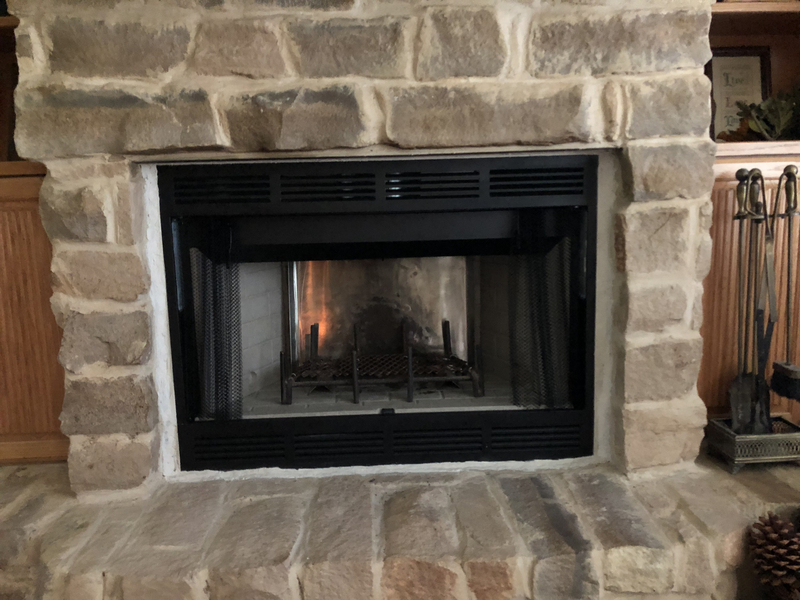 Since this is a decorative, inefficient, open-faced woodburning fireplace, the manufacturer does not provide estimated burn times or a BTU rating. Is this fireplace suitable and legal for mobile home? This unit is indeed approved for use in a mobile home. Does this item come with a damper that would open and close? Yes, there is a damper built into the fireplace. Is this unit considered "zero clearance"? Yes. The "zero clearance" refers specifically to the fact that the fireplace can be installed directly on a wood platform. Does it have an exterior air supply port? There is a knockout for an outside air intake kit to be added to this unit. How deep is the fireplace from front to back. This unit is 21 1/8" deep. is a rd-42 a woodburning unit ? The RD42 is indeed a wood burning unit. Can the framing depth be less than 22 inches? Unfortunately, the framing depth can not be reduced for this unit. If you use the blower offered, how does the heat from the firebox not affect it? The blower will be located beneath the combustion chamber, which is protected by sheet metal as well as the brick floor of the firebox. Where is the damper located? 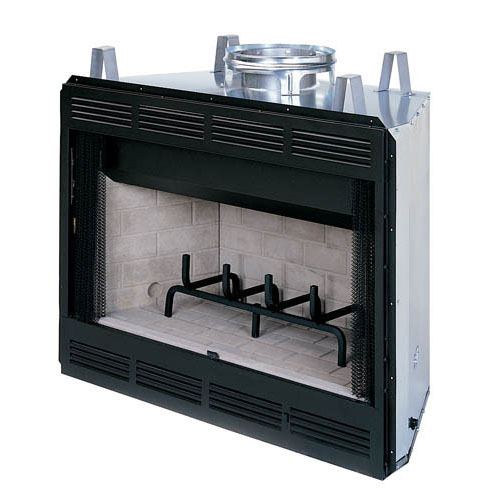 The damper is located at the top interior of the fireplace with an accessible damper control. 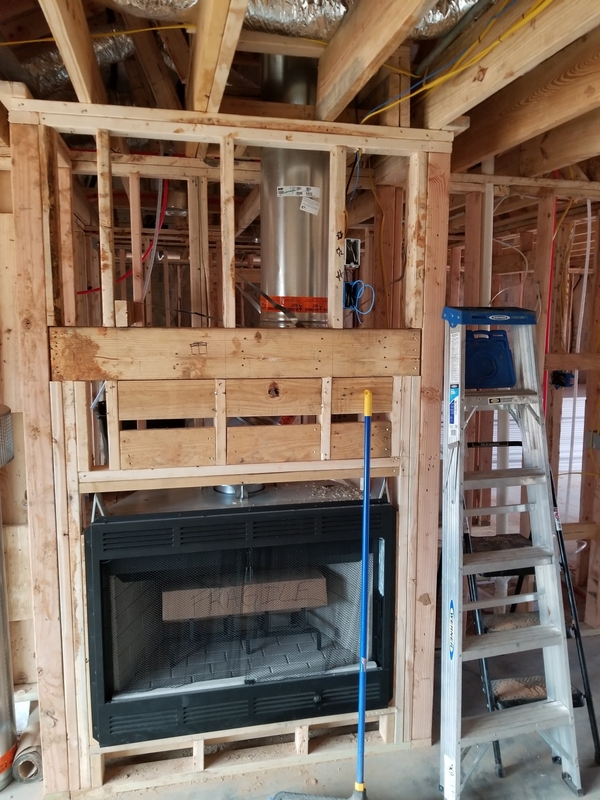 What size of vented gas logs will work in this fireplace? The log set size you can use for this fireplace will depend on your choice of vented or ventless gas logs and your preferred method of control. Can I use the 8" Superior pipe to vent or do I need a chimney? On the WCT by Superior, yes you would use the 8DM 8" Chimney by Superior. Is the minimum chimney height from the base of the chimney, or the base of the fireplace? That is from the base of the fireplace itself. What is the efficiency rating of this fireplace? This unit does not have an efficiency rating, as open faced wood burning fireplaces are meant to be decorative and do not put out much heat. Is a screen made for this unit? This fireplace includes a black mesh curtain pull screen. 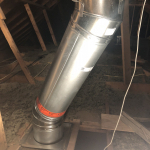 The total height to the flue collar on this unit is 37 1/2 inches. What is the approximate weight of this Superior 42" WCT Builder series circulating wood burning fireplace? This weighs approximately 180 pounds. 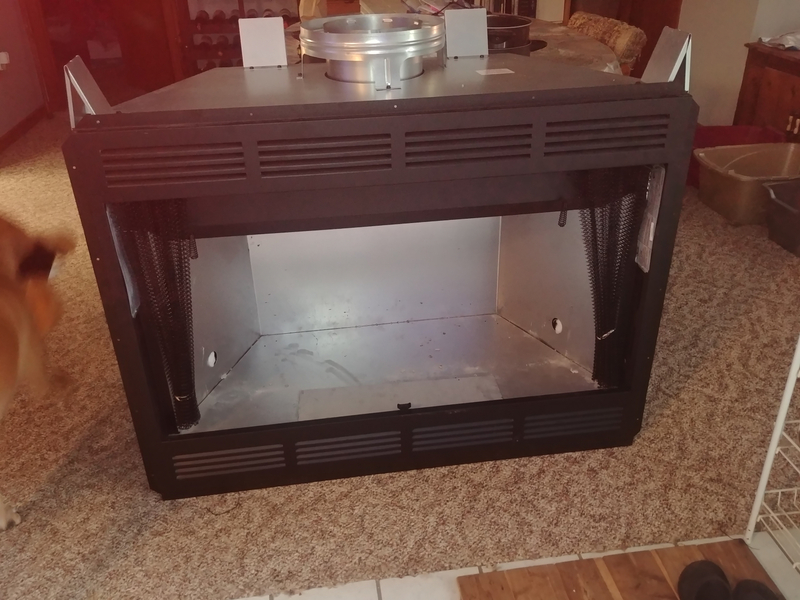 Can a gas or propane gas igniter be used with this Superior 42" WCT Builder series circulating wood burning fireplace (WCT2042WS)? This unit utilizes gas line knockouts on both the left and right sides. As such, a natural gas or propane log lighter could be installed with the unit. 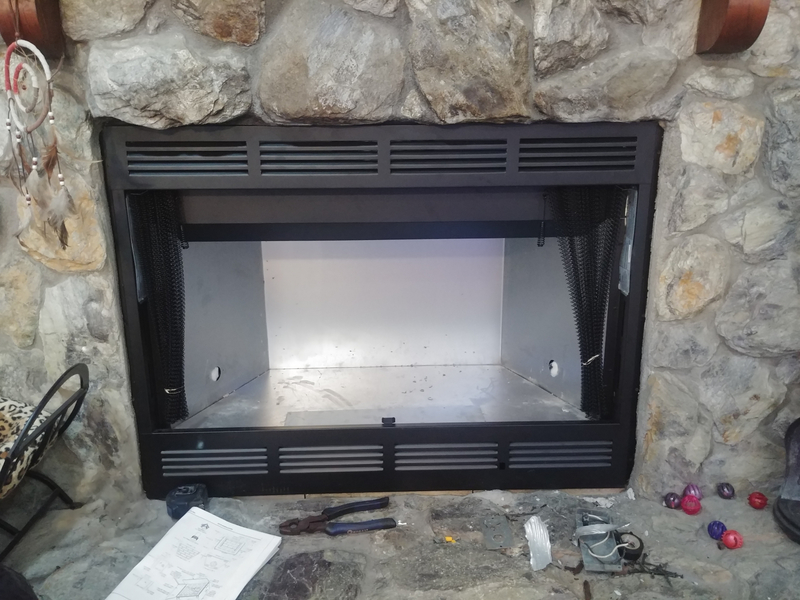 Would this Superior 42" WCT Builder Series fireplace work for an outside installation? This unit is not approved for use in an outdoor application. How many BTU's can this stove produce? Also, how many square feet can this stove heat? BTU output from this unit will vary largely, depending on the type of wood that is burned. Softwoods will create a small, cooler fire. Hardwoods can yield a much higher BTU output, usually in the 70 to 80K range. 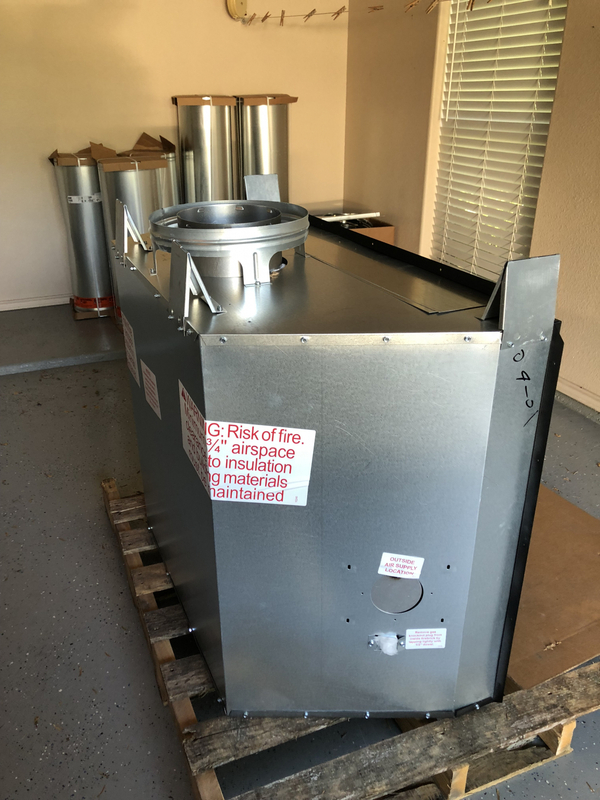 This unit, being an open faced model, is not designed to heat a large area and will only provide supplemental heat to the immediate area it is installed. Can I install a propane starter in this fireplace? You can indeed install a propane fueled log lighter system. Does this fireplace come with a blower fan? The unit does not come with a blower as standard, but it can utilize one. The Vantage Hearth Squirrel Cage Manual Variable Speed Blower Kit is the right product to use. My old unit was a little larger framed than this but it allowed me to install without taking a jackhammer to my rock wall and install it from the back. Frame is smaller but the firebox is bigger. Win win situation. Good quality. Beautiful fireplace, at any price, and plenty big enough for those cold nights. ProsBig, beautiful, and you can add a blower, glass doors, and even a outdoor air source. Perfect for anyone that wants a big fireplace to relax by and for Santa to come down! ConsEverything was seamless from start to finish. I will definitely use this web-site again - good price, good service, and great price! Received when told, arrived in good shape (no dents)! Unit showed up in great condition and all the items i purchased were there. Thanks. Very good customer service and good quality. Very fast shipping! Very Nice Product and Great Price. Haven't used it yet but it's installed and looks great. Best thing about this purchase would probably be the customer service. They're really helpful and make sure you talk to them when ordering instead of just picking something and checking out online. The representative made the package specific to my request and gave me a discount as well. The bricks are very pretty and the construction is well built. I was very pleased with this purchase arrived so quickly well packaged. I have not installed them as of yet due to the fact that we are still building. But I am sure we will enjoy both of them for many many years. The price is great and also shipped same day. ProsI bought this on a Tuesday and it was at my house on Friday! Insert had damage that was hidden by shipping cardboard. Was able to straighten most of it out. Front clip could not be removed for fan installation as per instructions. Gas hole in refractory did not line up with hole in sheet metal. Closest I could get was half. Had to cut and bend metal in order to get gas line through. Installation of the fans was a problem. Had to invert fans in order to get them to fit as the flange on the fans prevented installation per instructions. If these problems were not present, this was a very good insert for the price. Quick turnaround. Everything I could ask for! Item was delivered on time and Looks great in the space. We had a problem and the customer service from E-fireplace store was wonderful. They were quick to respond and get it taken care of even though it was not their fault. Wonderful Customer service. I would recommend them and will use in the future. Came in when expected and worked great. The fireplace was very well built. The instructions were complete and easy to follow. And best of all the shipping was fast and it was delivered when they said it would. Thank You for a great product. My equipment arrived very quickly and was everything needed to install a beautiful fireplace in my new home. ProsEverything needed to complete the install. Excellent service fireplace was at my doorstep within 2 weeks. Beautiful fireplace that was easy to install and a great addition to my home. I had a good experience with my purchase. The fireplace is a well engineered, easy to install, with excellent instructions. It was delivered on the day of estimated shipping date to boot! I was so pleased with this product, looks great in my family room.